Saeb Erekat expresses 'shock' over suspicions against his aide, despite admitting Israel routinely spies on PA activities. Saeb Erekat announced his "shock and surprise" to Channel 10 on Monday, two days after it was reported one of the senior Palestinian Authority (PA) official's aides had been arrested on suspicion of spying for Israel. The suspect was arrested by PA security forces in Erekat's offices on Saturday, on charges he had leaked information about the PA's position in regard to negotiations with Israel for over two decades. While Erekat would not reveal the identity of his aide, he did note an investigation was being conducted to determine if he had indeed spied for Israel and to what extent. 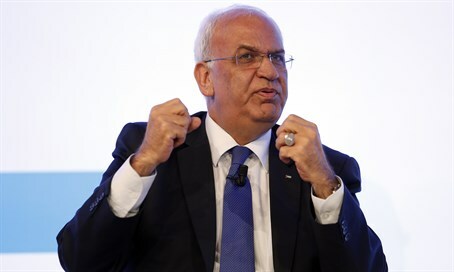 "The law will take its course," Erekat asserted. "I say the suspect is innocent until proven guilty." According to Erekat, this is not the first time Israel has kept agents and spies among the upper echelons of the PA's leadership, nor is it the first time to happen within his own offices. Palestinian security forces confirmed to Channel 10 that despite the political deadlock, Israel still has spies operating in PA-controlled territories and an extensive search will soon be underway to locate them. When asked about the freeze in negotiations, Erkat asserted he had "sent a letter to all of the EU's foreign ministers updating them on the 'achievements' of the Netanyahu government with regard to settlements, land confiscation and destruction of the two-state solution." "I think Netanyahu has succeeded in destroying the culture of peace from the minds of our people," he added.